The NYU Comprehensive Epilepsy Center Clinical Trials Department has been participating in clinical drug trials sponsored by various pharmaceutical companies for over 14 years. Dr. Blanca Vazquez, Director of Clinical Trials and Co-Directors Dr. Jacqueline French and Dr. Jocelyn Cheng have participated in over 100 multi–center protocols for both partial and generalized epilepsy. We offer patients who qualify, voluntary participation in clinical trials and access to new, anti-epileptic drugs (AED's) before they are marketed still being studied in clinical trials. Studies for both adults and children with epilepsy are conducted. Patients are screened for eligibility according to each trial's criteria by the physician along with the Research Coordinators, Veronique Ruppe, Ph.D., and Stephanie Tenzigolski, R.N. and if appropriate and willing are enrolled into the trial. Clinical Trials patients are seen regularly by the Research Staff to assess safety and efficacy of the drug or treatment being studied. If you or a loved one have uncontrolled seizures, are between the ages of 12-80 and are interested in participating in a clinical trial, please speak to your doctor or call the Department of Clinical Trials at (646) 558-0842 to see if you are eligible for any of our ongoing trials. 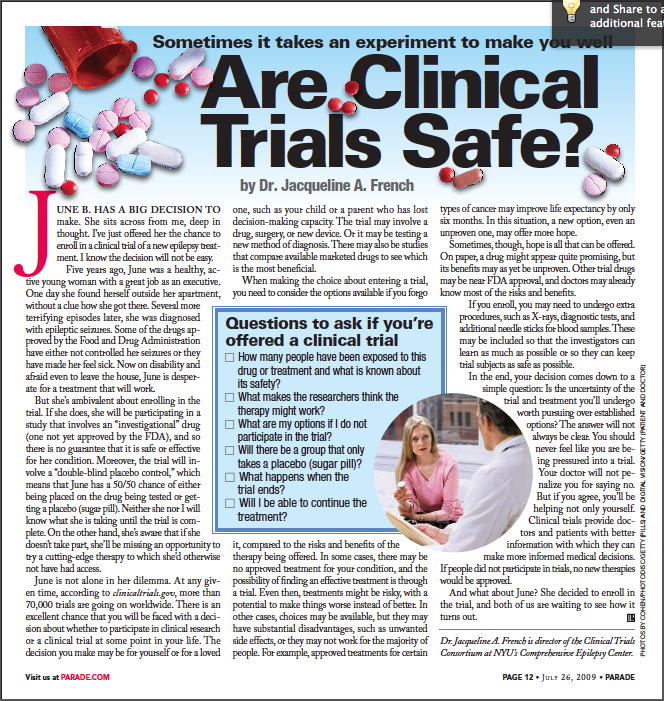 Dr. Jacqueline French inquires, "Are Clinical Trials Safe?"